On its eastern slope at the lower, southern end of Mount Moriah archaeology on a ridge above Jerusalem’s Gihon Spring leads to one striking conclusion: Features confirm the Matzevah (monument) as Jacob's stone, the one he anointed (Genesis 28:22) to mark his covenant at Beit El, Jerusalem (2Kings 23:4). 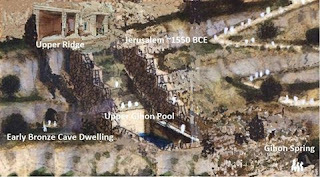 Therefore, it is the beacon that will ultimately identify the location of the altar for Israel’s third temple! It has been confirmed that temple worship features carved into the bedrock preceded King Solomon, dating back to the middle bronze age. 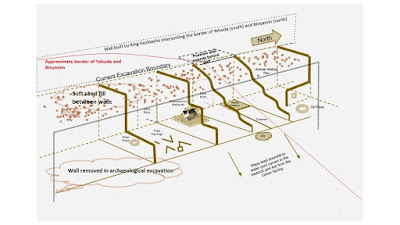 Further, that the ‘soft’ burial, between false walls protected the upper ridge for thousands of years until its recent discovery, as confirmed by lead archaeologist Eli Shukron. 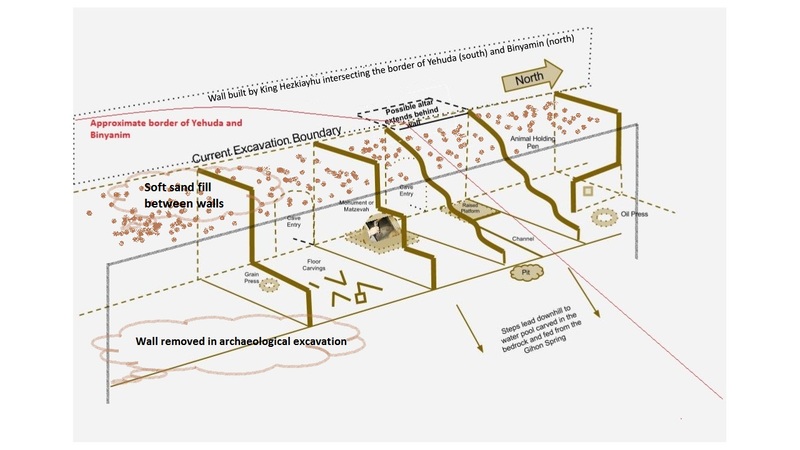 Elements of the city wall (image below) may have been built above the upper ridge by Jebusites and their allies while Israel was exiled in Egypt. The fortress protruding into the valley below the city wall was constructed adjacent to the Gihon Spring starting in the middle bronze age. It was most likely developed by geopolitical allies to obfuscate and prevent access to the temple complex on the upper ridge, which was cut-off by its construction - see video. The next image cuts the mountain (north), immediately south of the Fortress over the Gihon Spring revealing several features in the bedrock. The Upper Gihon Pool cavity, above the deeper round chamber cut passage over the bedrock and up the eastern slope. Archaeologists discovered the cavity filled with refuse from the Iron Age, but it may have been constructed during the middle bronze age as the quarry source of of the adjacent (northern) Double Wall complex and fortress. 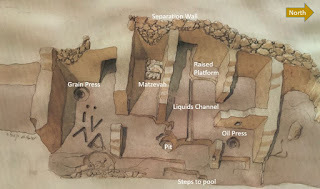 As seen in the image and below, the stairway extending from the Upper Ridge rooms containing the altar and matzevah (as identified toward the end of this article) to the bedrock that once filled the upper Gihon Pool cavity was cut as it arrived (to the pool). I believe this could be associated with the Millo and is not the stepped structure identified by Eilat Mazar. 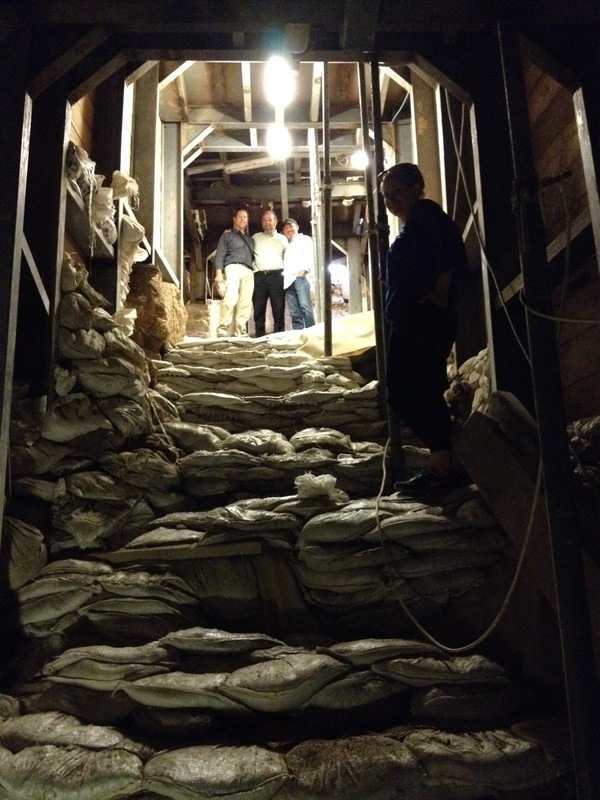 This is a different stairway ~10m south of the Double Wall or Fortified Corridor section of the Fortress over the Gihon Spring (excavated by Reich and Shukron). Iron age King David would not have erected a matzevah because that practice ceased with Israel’s forefathers at the end of the Middle Bronze age, time of Jacob. Additionally, the bedrock was chiseled using stone implements not iron, a sure sign of its earlier Bronze Age origin. Further, middle bronze age pottery discovered around the site confirms its date. Finally the matzevah must have been naturally formed because it is thin, precisely honed and smoothed, well beyond the technology of that time. The impressive features of the upper ridge including, oil and grain press, vessel holders, small animal pen, animal processing area, matzevah, liquids channel and platform of the original altar are definitive signatures of holy worship. Only the bones of kosher animals were discovered in the Upper Gihon Pool below. The upper ridge location on the neck of Mount Moriah contradicts mainstream Jewish custom that the only place for the altar of the future temple can be on the summit of the mountain. This issue can be resolved in a number of ways according to the character and stature of Jewish law and custom, but it will take time before it is accepted as a valid location by the authoritative leaders of Israel. 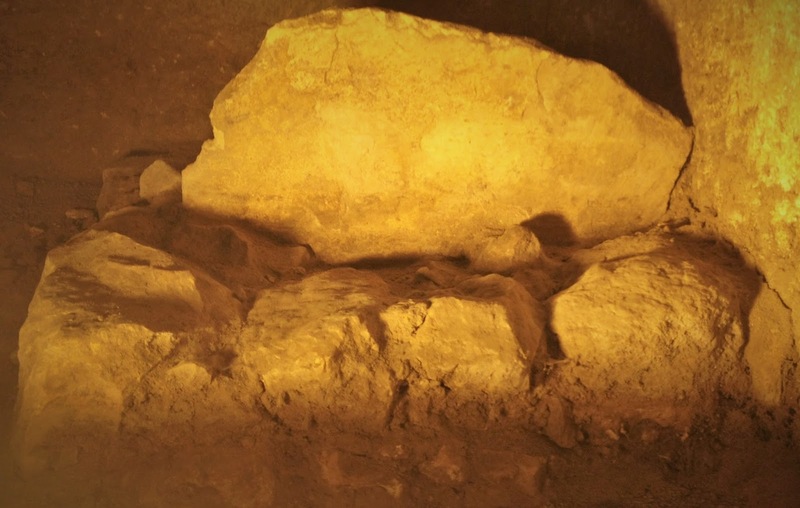 From the most ancient sources the neck of a mountain was always the location associated with the altar, but the first and second temple altar followed the location chosen by King David based on events of his life which opposed prevailing thought and present understanding of Jewish law. 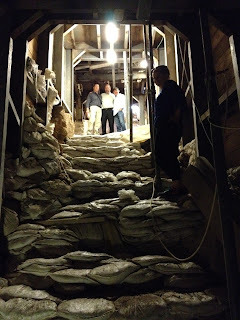 As the excavation on the upper ridge nears completion the public will, for the first time in thousands of years be able to make decisions about this amazing discovery. Exposing this phenomenon may just be the beginning of an impressive transformation.